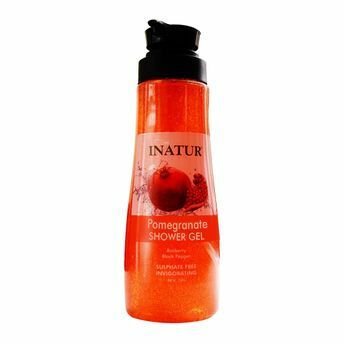 Invigoratingly formulated, the Inatur Pomegranate Shower Gel lusciously works on your skin and makes it soft. With a fragrance that is both arresting and refreshing, the Inatur Pomegranate Shower Gel deep cleanses your skin from within. It is enriched with Pomegranate oil, Black pepper oil and Raspberry seed oil. It softens skin and nourishes it to the core. It is too gentle on skin. It can be used on face as well. It can be used daily while bathing. Additional Information :Inatur is a renowned beauty brand that focuses on world-class skin care products made of 100% natural ingredients. Constant innovation and quality drives this company towards success. Inatur Pomegranate Shower Gel gets you one step closer to an ever glowing beautiful skin!